February 2019 | TOMMY JOHNSON, Jr.
Tommy Johnson Jr. celebrated the 30th anniversary of his nitro racing debut this weekend in Phoenix at Wild Horse Motorsports Park. The 2006 NHRA Arizona Nationals Funny Car winner qualified the Make-A-Wish Dodge Charger SRT Hellcat Funny Car fourth and was part of a wild first-round matchup versus Jim Campbell. Johnson had the advantage on the starting line but suffered a chain reaction of mechanical issues just past the 330-mark, which resulted in an explosion. While Johnson controlled his machine and brought it safely to a stop, Campbell drove away and looked to be on his way to victory. Before reaching the finish line, Campbell crossed the centerline and made contact with the timing block which resulted in a disqualification. 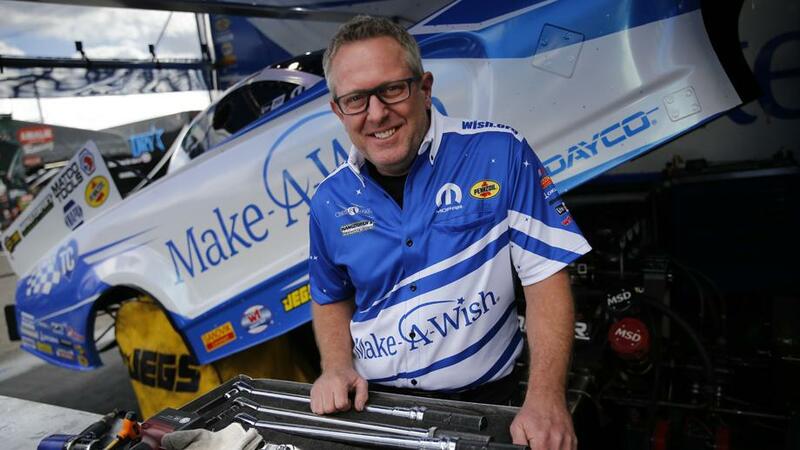 With extensive damage to Johnson’s Funny Car, the Make-A-Wish team worked feverishly to get him back to the lanes for his second-round matchup with reigning Funny Car world champion J.R. Todd. Johnson and Todd launched together, but Johnson’s machine dropped a cylinder early into the run and gave way to another big boomer while Todd drove away with the clean round win. BROWNSBURG, Indiana (February 21, 2019) – It was in 1989 at Wild Horse Pass Motorsports Park, the scene of this weekend’s Magic Dry Organic Absorbent NHRA Arizona Nationals, that Make-A-Wish Foundation Dodge Charger SRT Hellcat Funny Car pilot Tommy Johnson Jr. made his professional NHRA debut behind the wheel of a Top Fuel dragster. 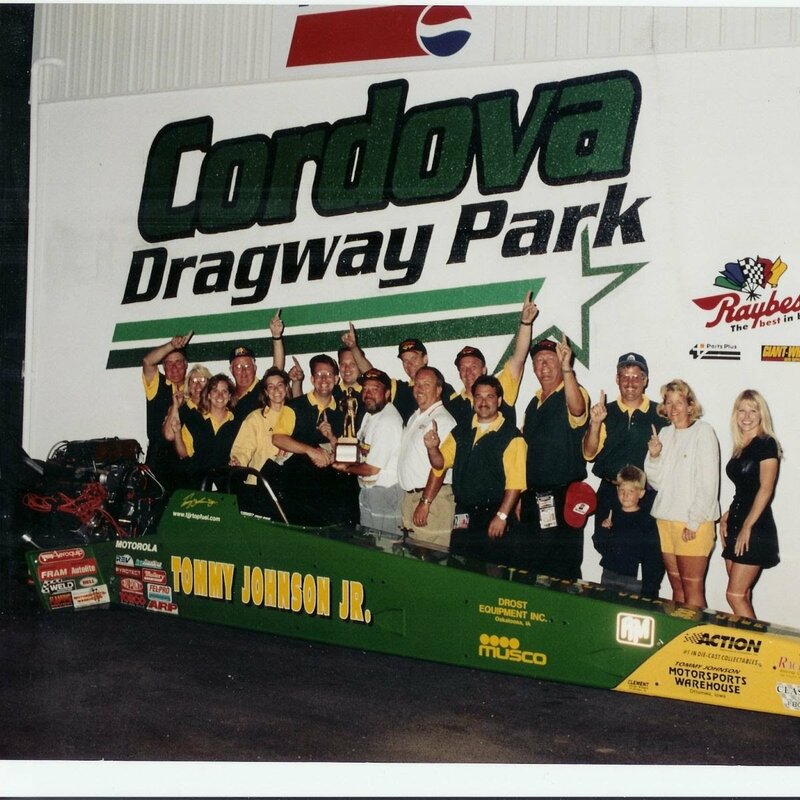 Fast forward to 2019 and Johnson, who made the transition to the Funny Car category in 1999, sits on an elite list of 16 drivers to have claimed event wins in both the Top Fuel and Funny Car categories, and is one of 19 people to boast No. 1 qualifiers in both of NHRA’s nitro classes. As Johnson, who has competed in 447 events and counting, prepares to celebrate his 30th anniversary of driving in the nitro ranks, he reflects on the past three decades spent chasing win lights all over the globe. 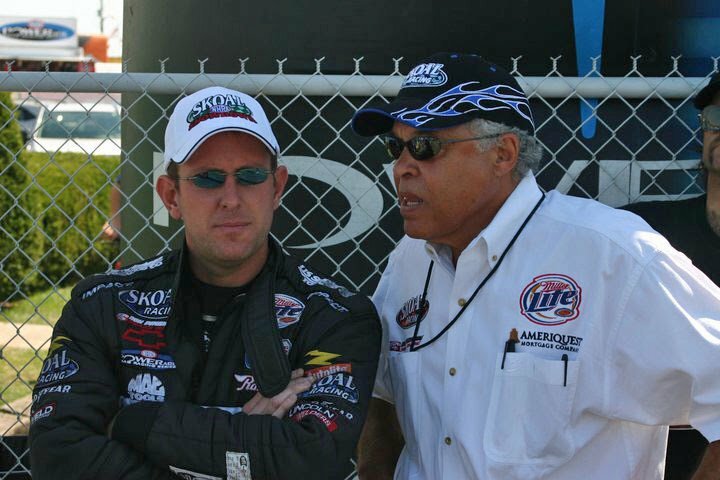 You’ve driven for four Hall-of Famers (Joe Gibbs, Don Prudhomme, Kenny Bernstein, and Don Schumacher). How have they influenced your career? I’ve learned something from all of them. To drive for Gibbs, Prudhomme, Bernstein and now Don Schumacher, it’s flattering to know that those four have picked you to drive their car and cool to know they have that kind of confidence in you, it makes you feel good. Your career has taken you all over the world, and you’ve won events in six different countries (United States, United Arab Emirates, Australia, England, Finland, and Sweden). Where do you consider to be your favorite place to race? I’ve won in six different countries, but each one of them has their own unique flair. 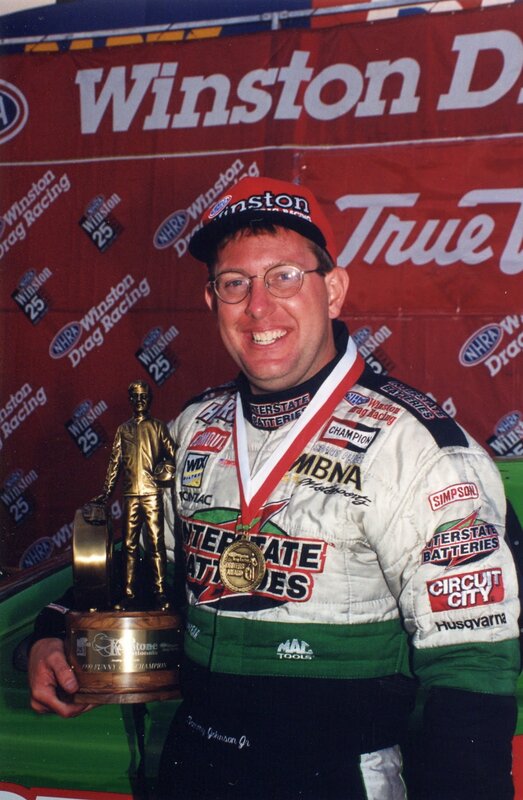 Of course, you want to race on the NHRA Mello Yello Drag Racing Series tour, that’s the biggest and best tour, but as a kid growing up, I always wanted to race in Australia, so it was cool to race there and get a trophy. To be able to race at Santa Pod, and over in Sweden and Finland, and the Middle East, there aren’t too many people that have had the opportunity to race a fuel car in the Middle East. I was always wanting to race the NHRA tour, that was always the goal, but it has been really neat to be able to race a Top Fuel car in all of those countries and win. I have an international trophy cabinet and an NHRA trophy cabinet, and not many people can say that. Who has been your favorite competitor – past or present? I don’t really have a favorite competitor. I think the coolest thing about it is I’ve been doing this for so long that I’ve had the opportunity to race different generations of drivers. I’m one of the few people out there right now that actually got to race against Shirley Muldowney and Eddie Hill and Don Prudhomme, Kenny Bernstein, Joe Amato and all of those guys from back in the day. And through the middle part of that, I got to race a different group of drivers, and today I’m racing another distinct group of drivers. I think with the longevity of it; it’s hard to pick just one, it’s just cool that I got to race against all those different generations of drivers. Not many people that can say that. I think it’s cool that I’ve done that and am still doing it. Stating the obvious here, assuming your biggest and current goal is to win that first elusive championship title. Aside from that, what’s another item on our bucket list that’s been nagging at you? Obviously, you want to win the championship. I’m not going to be upset if that never happens, they’re extremely hard to come by and extremely hard to win, and sometimes it’s just not your year. I think we’ve proven we’re capable of winning a championship. I’ve finished the season ranked third three times now and second once. The biggest thing I’d like to do, besides winning a championship, is win Indy. I’ve been runner-up there once and lost it on a holeshot, and it’s probably haunted me and has been the biggest aggravation of my whole career. I should’ve won that thing, and the last few years I’ve been to the semis three out of the last four years. It’s just another race, but it’s the big one, and I’d like to add my name to the Indy history books. What race or moment stands out from the rest throughout your professional career? There are several things that stand out throughout my career; one of them being in the four-second club and 300-mph club. There are only five of us (Top Fuel) drivers that are in both of those clubs. It’s myself, Eddie Hill, Joe Amato, Kenny Bernstein, and Don Prudhomme. That’s really cool to have your name on a list with those legends. It’s an accomplishment that can never be taken away. The biggest victory that I’ve ever had has to be Englishtown in 2007. We were No. 1 qualifier, had the car to beat all weekend, and then it blew up and caught on fire first round. We won the round but burned the car to the ground, so I thought ‘that’s it, the weekend’s over.’ The crew was able to rebuild the car, and we went on to win the race that day. You can’t do that; it’s not possible to rebuild a car from the ground up. We took it down to the bare chassis, even had to put new seatbelts in it because the seatbelts were burned out of it. To be able to do that, come back and win the race was just a phenomenal feat – the ultimate team effort. The second round we ran low E.T. of the day, I won the semis on a holeshot and then we won the race, it was an incredible day, and you can’t write a script that would turn out that well. There were several times when I didn’t know if I was going to race professionally again. It’s super tough to get a ride out there, especially a full-time ride, but I didn’t go away. I stayed in front of people. I worked for DSR doing the track evaluation job and just made sure people always saw my face. It’s hard to go to the races and watch other people do what you want to be doing, but I knew my only chance of getting back out there was making sure I wasn’t forgotten. We’re in a fast-paced sport, and they forget you in a hurry and I just made sure I was always in front of people, and if the opportunity ever came, they would think of me. Out of sight is out of mind, so I never let that happen. “We’re heading to Phoenix this week and we were the runner-up there last year. We had an issue with the car in the final and felt like we could have won that race, so we’d like to go back and get a little redemption. We felt like we let that one get away from us. Tommy Johnson Jr.’s first trip to Wild Horse Pass Motorsports Park, the site of this weekend’s 35th annual Magic Dry Organic Absorbent NHRA Arizona Nationals, as a nitro driver came in 1989. Tommy Johnson Jr.’s first trip to Wild Horse Pass Motorsports Park, the site of this weekend’s 35th annual Magic Dry Organic Absorbent NHRA Arizona Nationals, as a nitro driver came in 1989. With the race marking the 30th anniversary of his Top Fuel debut, the now Funny Car championship contender reflected on what three decades of nitro racing has taught him. 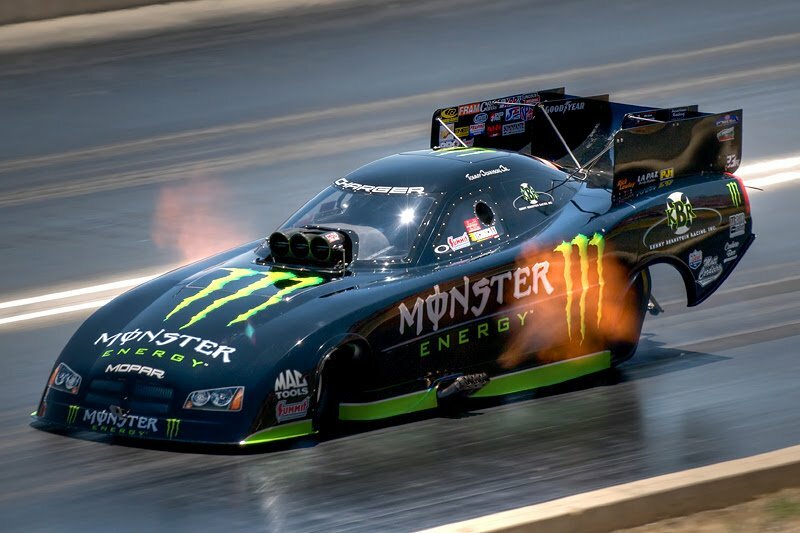 With that in mind, the track just outside of Phoenix holds a special place in Johnson’s heart and he will look to grab his second career win at the early-season NHRA Mello Yello Drag Racing Series race. 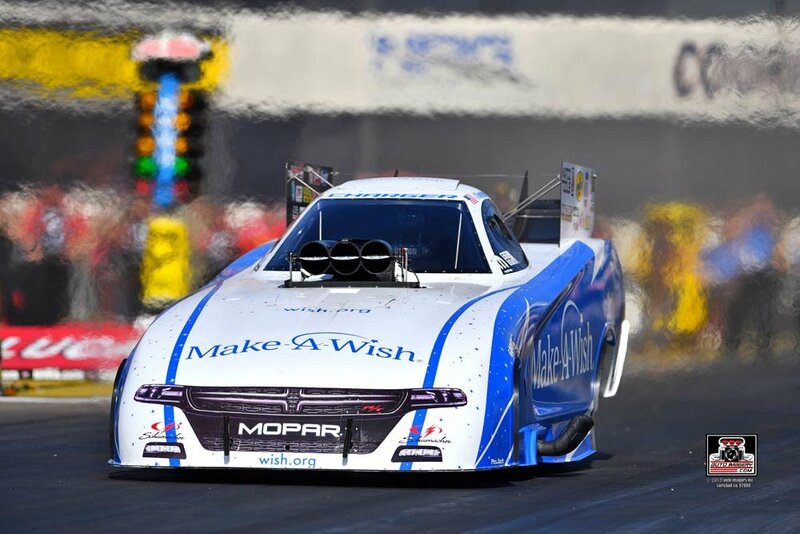 The Don Schumacher Racing standout lost in the final round of the race a year ago, but is off to a strong start in his 10,000-horsepower Make-A-Wish Dodge Charger SRT Hellcat. Johnson advanced to the semifinals at the 2019 opener in Pomona as he tries to take it a step further in Phoenix. Steve Torrence (Top Fuel), Courtney Force (Funny Car) and Chris McGaha (Pro Stock) were last year’s winners of a race that will once again be televised nationally on Fox Sports 1 (FS1), including live finals coverage starting at 6 p.m. ET on Sunday, Feb. 24. It is the second of 24 races during a 2019 season where Johnson may already be ahead of schedule. Despite missing out on a win in 2018, Johnson was impressively consistent and finished third in points, finishing off the year with a final round appearance in Pomona. The team left well enough alone, made very little changes in the off-season and picked up where they left off last November. Johnson feels the team is ready for a breakthrough. Johnson qualified third with a 3.904 at 327.03 mph in Pomona and then went as quick as 3.876 in eliminations en route to the semifinal finish. For a team that is admittedly a slow-starting one, it was a good way to begin 2019. Of course, Johnson wants a victory in Phoenix and to do that, he’ll have to get past Pomona winner and 2017 world champ Robert Hight, defending world champ J.R. Todd, 2016 champ and DSR teammate Ron Capps, Shawn Langdon and Jack Beckman. Top Fuel defending world champ Steve Torrence will look for a second straight win in Phoenix after finishing as runner-up to Doug Kalitta in Pomona. Others to watch include Clay Millican, Terry McMillen, Leah Pritchett, Antron Brown and 2017 world champ Brittany Force. To purchase general-admission or reserved seats for the Magic Dry Organic Absorbent NHRA Arizona Nationals, call 877-840-0457 or visit https://racewildhorse.ticketforce.com/. Kids 12 and under are free in general admission areas with a paid adult. To honor the Salute to First Responders, military and first responders can save 20 percent on general admission tickets at the gate.